As a past volunteer, you may find that it is difficult for friends and family to truly understand the impact of your international experience. Many former volunteers are eager to encourage others to travel and volunteer abroad so that they can have similar experiences. We are always grateful to our Alumni for their support in promoting Projects Abroad. There are a number of activities, both unpaid and paid, for past volunteers to help spread the word about Projects Abroad. If you are interested in taking part in any of these, please email us at alumni@projects-abroad.ca. Email Contact - Potential volunteers often ask to speak with Alumni from a specific project or country. This is one of the best ways for them to really get a sense of what it is like to volunteer or intern abroad. We maintain a list of Alumni who have agreed to give out their email address to potential volunteers. If you are interested in adding your email to this list, please let us know. Tell your Friends – Share your experience with those around you. Often your enthusiasm, information, and support will be the deciding factor when they are making the decision to go abroad. Speak to your Counsellor/Advisor – Many volunteers are introduced to the concept of volunteering or interning abroad through a High School or Post Secondary Advisor. If you are a student, you are in a perfect position to speak to an advisor at your school about your time with Projects Abroad. If you are able to set up a meeting with a few advisors, please email us and we’ll be happy to send you a packet of materials to give them. Write about your experience – Volunteer Stories are a great way to sum up and reflect on your international volunteer experience. They are also one of the most valuable tools that we can offer potential volunteers. Feel free to view Volunteer Stories from other Alumni to get an idea of what we are looking for. A story should be about 1-2 pages, 12pt font. Please email us for more details if you are interested in writing a story. Post a Review – You might remember from your own experience, it’s helpful to get unbiased opinions of the organizations that you are considering. Help others by posting a review on GoAbroad Reviews, Abroad Reviews, or Go Overseas Reviews. A review is usually only about 2-3 short paragraphs about your time abroad. Email us with the links to your reviews once they are posted. Put up Posters – Posters are one of the simplest and most effective ways of getting the word out about Projects Abroad. We send Posters out once a semester. If you are interested in receiving a Poster Pack, please request one using this form or send us an email. Make a Volunteer Video - If you have video footage of your time abroad and feel comfortable talking about your experience, make a video for our website! Videos need to be at least 1-3 minutes long and should contain video footage in country, volunteers in action, and interview/personal testimony of your time abroad. You can view videos from other Alumni here. Please email us for more information. Attend a Study Abroad Fair – Schools around the country often hold study abroad or international opportunities fairs. As a Projects Abroad representative, you will be able to provide valuable information for the fair attendees and share your own experience being abroad. Email us with your current school to see if there is a fair in your area. Attend an Information Session – Each year we hold a number of Information Events in key areas of the country. Our Alumni representatives are one of the most important aspects of these events. Contact us by email if you are interested in attending an Information Evening in your area as an Alumni representative. Hold a Presentation – Many people in your school or community could benefit from hearing about your experience. If you are comfortable speaking about your time with Projects Abroad, contact us to learn more about setting up a public presentation in your school, work place, or community. Write a Newspaper Article – If you have connections with your local, regional, university, or club/society newspapers, please contact us for details on writing a newspaper article related to your experience with Projects Abroad. 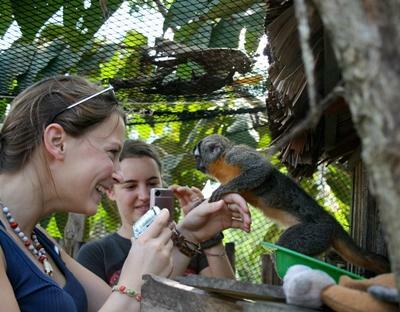 Link to Projects Abroad – Most volunteers find out about volunteering abroad over the internet. If you have connections with your high school, study abroad centre, university or advising office, you may be able to post a link to Projects Abroad on their website. Please email us with the proposed page and we’ll send along all of the link information that you will need.